A bit premature maybe, but if you’re in the UK, April showers season will be upon us before you know it. But what to do when you’re facing the dilemma of staying dry, while also keeping your hands free to text, hold coffee or, you know, other stuff? Well, you’re in luck; Fendi has you covered (literally) with a new hat that debuted at its AW18 menswear show today in Milan. 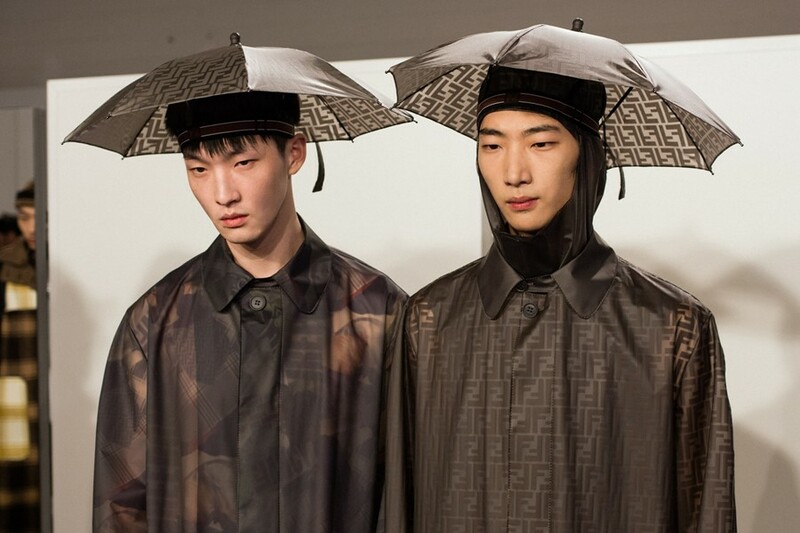 Combining a hat and an umbrella, the all-in-one style has all the benefits of sheltering you from the rain – with the added bonus of keeping your hands free. Genius! But rather than a multicoloured style, similar to one you might find on a tourist or Jim Carrey in Bruce Almighty, Fendi’s altogether chicer version comes bearing the Italian house’s distinctive ‘F’ monogram. The collection itself was all about the ease of travel – the catwalk had a conveyor belt of luggage going down the middle – which explained the idea behind the hands-free accessory. While you might be thinking nobody could pull of such a look, we disagree. We challenge queen of everything Rihanna to do her thing and wear the hat for her next performance of 2007 hit “Umbrella”.